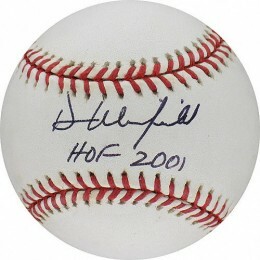 Dave Winfield cards and autographed memorabilia are among the most popular for players who starred in the late 1970s and through the 1980s. He brought his hitting prowess to six different teams during his 22-year career. The 12-time All-Star won seven Gold Gloves and six Silver Slugger Awards. He finally won a World Series with the Toronto Blue Jays in 1992. Winfield has two rookie cards. One is from 1974 Topps Baseball and the other from 1974 O-Pee-Chee. Additionally, Winfield has a team-issued card from the same year, as well as food issues from Dean's and McDonald's. Collectors looking to complete a master checklist should also note that he has a 1973 Dean's food-issue card. 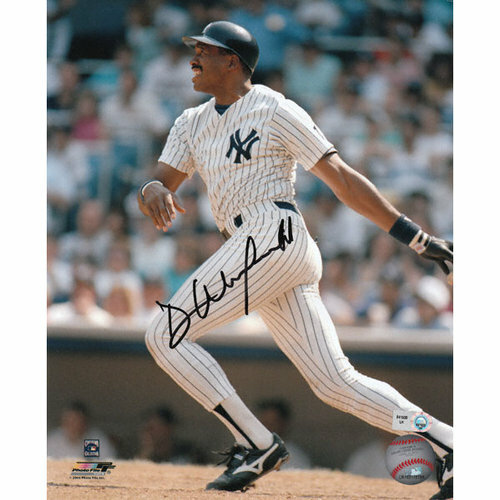 Dave Winfield's first certified autograph card is the 1999 Upper Deck Retro Inkredible insert. The card is not serial numbered and an exact print run has never been released. The card has a Gold parallel numbered to 31. His first memorabilia card was also produced by Upper Deck that same year. It is part of the 1999 Century Legends set. 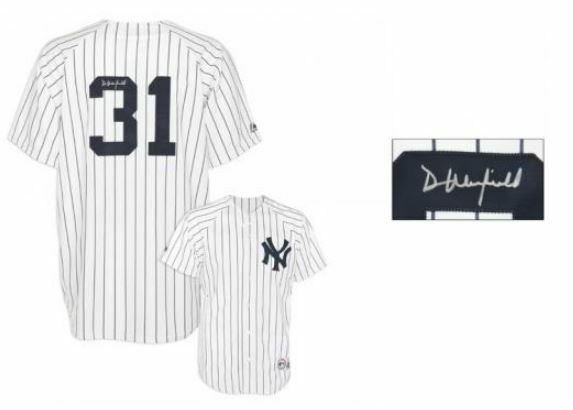 The card contains a swatch of game-used jersey. It is not serial numbered and the exact print run is unknown. Winfield was a willing in-person signer throughout his career. He has also frequently participated in larger signing events. As a result, there is a healthy supply of his signed memorabilia in the marketplace. However, demand remains strong with fans from multiple teams. This has helped to ensure consistent and steady value for his signature. 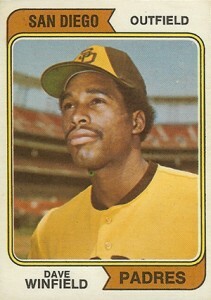 Identical in design to Winfield's Topps rookie, the O-Pee-Chee version has bilingual text on the card back. The print run of 1974 O-Pee-Chee baseball is considerably shorter. Often miscut, the 1974 Topps Baseball set is well known for its centering issues. As a result, professionally graded cards returning in even mid-grade condition command a premium. High-grade examples can sell for several hundred dollars. Dave Winfield Graded cards 6.5 Yankees; 2.5 Padres Beckett! 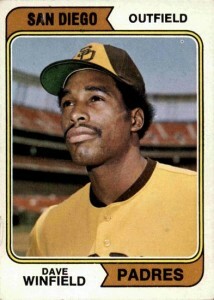 1976 Topps #160 Dave Winfield - San Diego Padres, Near Mint Condition! 1989 - Fleer - Dave Winfield - GRADED GEM MINT 10!!! 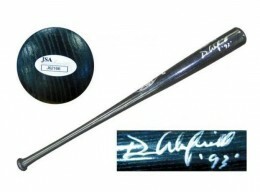 Below you will find an example of what Dave Winfield's authentic signature looks like. This can be used as a first point of reference for determining the legitimacy of autograph memorabilia, but is not a substitute for having your items authenticated by a well-respected professional autograph authentication company. Some of the trusted sources within the sports memorabilia market include the following companies: PSA, JSA, Steiner, Mounted Memories and Tristar. Click on any of the images below to view full size photos. The signature is written in cursive, with the "D" and "W" being larger than the rest of the letters. The "D" starts near the top of the entire letter with an angled down stroke. The pen stays on the item and a line up is created before curving back down and creating a loop. This allows the pen to stay on the item as it flows into the remaining letters. The "a-v-e" are all very small but discernible. The "W" is written with a lean to the right and a shallow middle hump. The "i" and "n" look identical and the "i" is not dotted. The "f" is distinct with an angular loops that come to a point. They rise above and fall below the horizontal plane with the top being slightly longer than the bottom. The "l" and "d" are tall and narrow.